Born in Iran and based in Washington, DC, Avish Khebrehzadeh stood out from the crowd at the 2004 “Mediterraneans” exhibition at the Museum of Contemporary Art in Rome with her hypnotic and transportive In the Horizon I, 2004, a video animation of softly drawn, nearly featureless figures perambulating, floating, and swirling through indeterminate space. The animation and a group of olive-oil-and-graphite-on-paper drawings subsequently shown at Susan Inglett Gallery in New York continued to reveal the artist’s intriguing ability to engage the viewer with ambiguity. The artist’s new work, a series of small-scale oil-on-panel paintings (most 16 x 20”), continues in this vein, but deep blues and vague whites on black backgrounds have replaced her familiar soft, amber hues, adding theatricality and contributing to a brooding and vulnerable environment. The subjects, individuals or small groups of figures and animals, hover in a portentous blackness. Her command of form, accompanied by stylistic restraint, is undiminished, and the artist occasionally startles with her ability to evoke emotion with a simple, aqueous brush stroke. 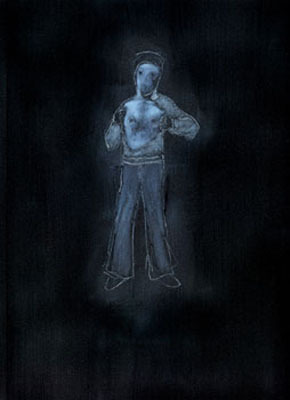 Ira 1, 2006, features a lone, subtly delineated figure spreading open his shirt to bare his chest. The image, an allusion to Giotto’s The Ire in the Scrovegni Chapel in Padua, is both defiant and desperate, while another work, Man Blowing the Bubbles, 2006, offers a terse and elegant examination of solitude and the ephemeral. Khebrehzadeh’s narratives are sparepoetic rather than expository. Quoted in the press release, she says: “I like to be frugal in giving the visual information to viewers. I want each viewer to participate and finish the story with his or her own imagination.” It’s an approach that works.